It appears David Wilcock's website was hacked over the weekend as well as Corey having issues flying back from GaiamTV studios. 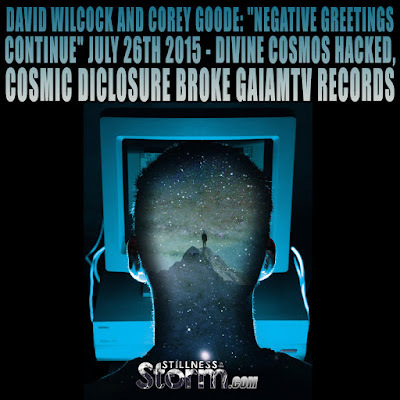 Whether or not there is any correlation to the Cosmic Disclosure debut last week is unclear. Possibly David will release more details about the hack in a future update. The Cosmic Disclosure series is presently on its 4th episode. Much of the information covered is already available for free on the spherebeingalliance.com page. 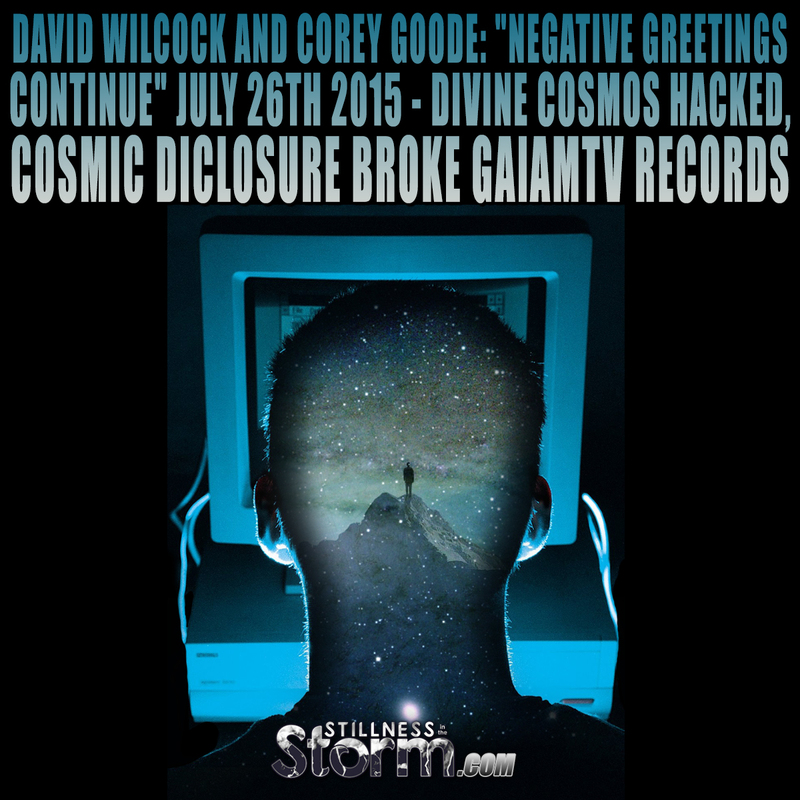 Cosmic Disclosure has now shattered all existing records in the history of GaiamTV by a very significant degree. It is too early to tell how many of these viewers have become subscribers, but that’s really up to you! This is a big relief for us, since we’ve risked our lives and been through all sorts of outrageous negative experiences in order to reach this point. The Cabal genuinely did not think we would ever get it together. Now the Divine Cosmos site has been taken offline, but Gaiam’s site is still running. Our site has almost never before had such a massive hack attack, and the timing is obviously no accident. The weekend is always when things “go viral” and this is a very transparent move. Who else would have the means and the resources to do this — and why now? Sorry, guys, you will have to suffer the consequences of your actions. Humanity will be set free. We are not your slaves. We heard back from our server company and found out that a massive attack destroyed one of the hard drives in our database. They have to completely replace it to restore our site. This “just so happens” to occur on the weekend of Cosmic Disclosure launching. Thankfully, our server is robust, and significantly expensive. We have to do it that way because of the threats we face and the high traffic we get. One of the things we have is a RAID array on our database. This means that everything is stored in more than one place. We shouldn’t lose any data. No word yet on when we will be back up, but it will probably be just in time for us to lose the entire weekend. LOL. In all the years I have traveled I have never been delayed by more than one day. The idea of a four-day delay is almost unthinkable. And it was his daughter’s birthday to boot. They set out on an epic 15-hour drive, only to find out that there is a massive conference of wind turbine engineers going on, which led to almost total occupancy of every hotel from Colorado through Kansas. So they drove to exhaustion, crash-landed at a very nasty motel, and now have 12 more grueling hours to get through. On this shoot, the rule was literally “Massive Negative Greeting Every Day.” My own Alamo shuttle bus actually broke down on the way to the airport. The driver rebooted it and drove in with hazard lights and a slow speed. I filmed it just to document the highly bizarre and ongoing interference we encountered. I see all of this stuff as confirmation that the work we are doing is of high significance in restoring peace, freedom and prosperity to our planet. And all this does is make me want to fight even harder to get the word out — so congratulations, guys! The July 20th edition of Weekly Geopolitical News and Analysis opened with the following quote attributed to a top Pentagon person. That would make me grumpy. Too bad it was not true, but like you said, I have been hearing similar things. We have had crazy attacks since launching Cosmic Disclosure, including a root-level hack of our website on the premiere weekend that is requiring us to start over from scratch. The hacker could have accessed everything on our site and rewritten it however he chose.